Emma has macular degeneration and is losing her ability to see. Dr. Randy Kinkade has prescribed her special telescopic glasses to help maximize Emma’s vision. 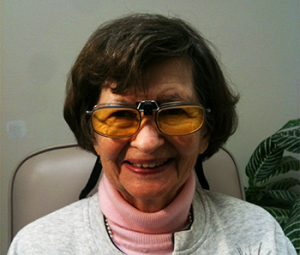 Now she can see better and read again. If you or a loved one is having trouble reading call 1-888-778-2030 to find a doctor near you. Dr. Paul Woolf, a Low Vision Optometrist and Mr. John Larson from Arizona talk about driving with bioptic telescope glasses. Mr. Larson demonstrates how he use bioptic telescopes while driving for about a year now. In the first part of this series, Dr. Jarrod Long (Midwest Low Vision) talks about the anatomy of the eye and pinpoints where the macular is and what it does. Dr. Evans has created a professional commercial about his low vision practice. Give him a call today or visit www.evanseyecare.com. Dr. Mark Rinkov defines “What IS Low Vision?” and discusses how most regular eye doctors tell their clients “Nothing more can be done”, this is not always the case! Give us a call to find a doctor near you. IALVS Doctor, Dr. Golemba discusses two types of macular degeneration, wet and dry, and why you need two doctor specialists. A retinologist and a low vision eye doctor.